Di's Pillars feature lovely green and gold accents. Margo's Mignonette's play nicely with these elements within the Pillars. Glorious upholstery chintzes featuring architectural columns festooned with flowers or ribbons appeared in wood block prints around 1800 and again later in roller printed designs after 1825. They lost popularity for decorating during the 1830s but continued to be used in quilts through the 40s and 50s. Pillar prints are a distinctively British styling and were especially popular there and in America for curtains and bedcovers. These early designs featured short columns topped either by an ornate capital or flowers. The columns could be classic Greek, or twisted, carved designs wrapped with ribbons, garlands, or vines with tendrils. Polychrome wood block printing produced especially beautiful fabrics in this style and English printers offered hundreds of different designs early in the 19th century. Roller printers revived the popular pillar print motifs between 1825-30.Copper rollers laid down the primary pattern that was then overprinted with extra colors by blocks or surface rollers. 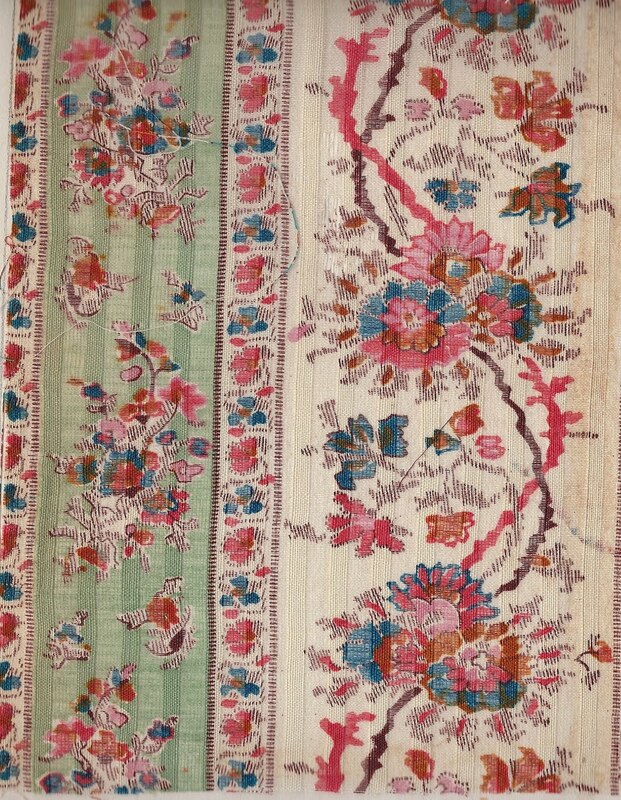 These later textiles still featured a basic column with flowers plus extra elements that had not appeared in the earlier versions. Often pieced blocks in quilts from this period (first half of the 19th century) contain small squares or triangles cut from a large pillar print (12” to 20” repeats). Sometimes you see only a small portion of the flowers; other times an odd piece of architecture. In her great book, “America’s Printed Fabrics, 1770-1890”, Barbara Brackman recommends purchasing 5 yards of a Pillar Print. Use it for borders and cut it up for pieced blocks! Margo, I am in the midst of cataloging a quilt with three lengths of a blue and white pillar print with fruit rather than flowers. Your post is most timely and helpful.